Video Poker is a popular casino based game that transitioned to online gaming with ease. Online casinos offer a selection of video poker games including Deuces Wild, Jacks or Better, Aces and Faces, Joker Poker and Bonus Poker. Silver Oak Casino alone offers 17 different video poker games. And as always, when you play online you have the freedom to play anywhere and anytime with flash casinos and no download options. Video Poker is a hybrid of slot machines and poker, if you are familiar with these games you are way ahead of the learning curve. Make the best hand out of five cards by discarding and replacing cards that don’t help you. The standard poker hands apply from Aces High up to a Royal Flush. To get a handle on the game, Lincoln Casino has a practice mode and 25 Video Poker games for you to play. 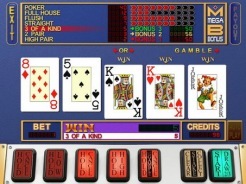 Each Video Poker game is slightly different and has a variation on the basic rules. Different cards are wild and sometimes different hands have extra prizes attached. In Bonus Poker there is a bonus payout for hands with four-of-a-kind. Coliseum Poker has a Progressive Jackpot option. In the same way as each slot machine online adds a twist on the basic game, Video Poke games vary. Find the one that suits your way of playing, or experiment with several games for a change of pace. There are multi-handed games as well. In Four Handed Face the Ace you are dealt four cards at the bottom of a 20 card grid. Choose the cards you want to hold and those cards will fill the three cards above them. Then draw. The cards you didn’t hold and the cards above those will be filled with new single cards. It is possible to have multiple winning hands in this game, and if you hit four face cards or four aces – you win the bonus. If you know the odds of getting your winning hand, you will know better which cards to keep and which to trade in. Less than 1% of hands played include the same five cards received on the deal, so knowing when to trade and what to trade is the key. For example, I just played a hand of 5 Cent Bonus Deuces Wild at Bodog Casino and was dealt the 5 of Hearts, the 9 of Hearts, the 7 of Clubs, the 2 of Spades (Wild) and the Jack of Clubs. I traded in my 5 of Hearts and got the 7 of Spades. Three of a kind – I win. You can win too with Video Poker. Familiarize yourself with the game and play!